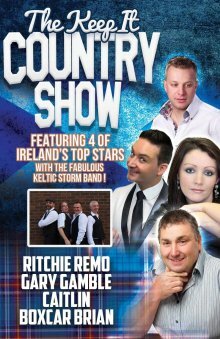 Join four of Ireland’s top country stars for an unmissable Keep It Country Show filled with toe tapping Country and Irish classics, music and laughter that will have you singing and clapping all night long. The show features a great mix with the hilarious Gary Gamble and his surreal impressions of Daniel O’Donnell, the very popular Boxcar Brian, the pure voice of the star of the Co Down Caitlin and Irelands most energetic performer – fiddle sensation Ritchie Remo. All accompanied by the fantastic Keltic Storm Band this a super show not to be missed. Last year’s shows were sell-outs so early booking advisable!